Yet again, with the help of my friend, Inks, Heir Audio 3.Ai and 4.Ai (generic versions) have been analyzed thoroughly. Initially I requested a review sample too to the manufacturer, but somehow my emails did not make it to their inbox. Hmm. I don't know much about Heir Audio, but it is known at Head-Fi.org that they make fine custom IEMs. Since their generics have same internal components as the customs do, users who are currently using custom IEMs from Heir Audio might find this analysis quite useful as well. PRO: Hand-crafted; nice aesthetics. Low-distortion. 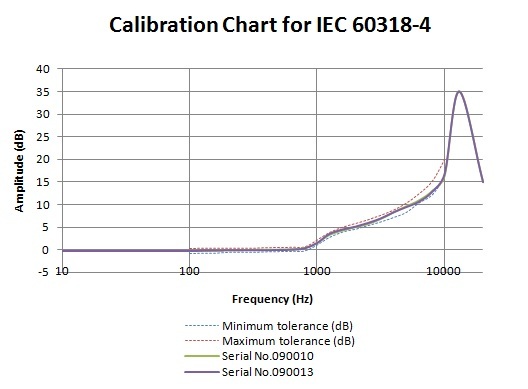 4.Ai's impedance characteristic is quite linear. CON: Inverted polarity. A mid frequency deep-null is present due to the crossover network design error. Even assuming the IEM's design goal was to achieve an user-tweakable electric linearity, just like with the case of JH Audio, a steep notch at 4 kHz is not something that can be easily restored with a conventional equalizer. On top of that, the frequency bandwidth is still too short. ON SECOND THOUGHT #1: Changing the insertion depth does not alter the sound of 4.Ai that much, even with 3~4mm distance. Of course, there is not much of high frequency to be altered to begin with. ON SECOND THOUGHT #2: Adding an extra resistance to 4.Ai is definitely not recommended- it will totally skew the frequency response to another level. 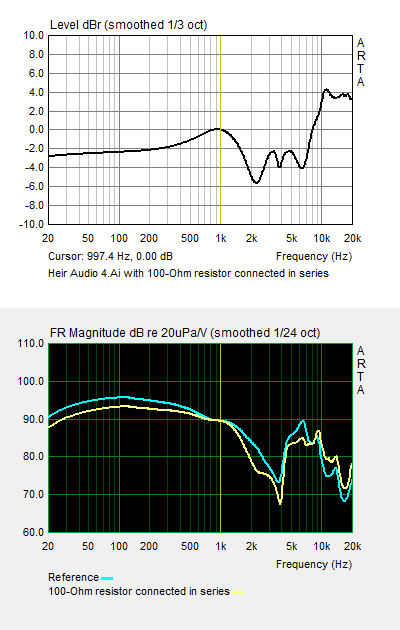 The IEM gains little more SPL over 10 kHz frequency range, but the deep-null becomes much worse. ON SECOND THOUGHT #3: Heir Audio sells an upgrade cable, Magnus 1, for $149. Since the manufacturer says it has more silver content, it should lower the overall impedance of the IEM, and increase the output SPL due to improved efficiency in electroacoustic transduction. 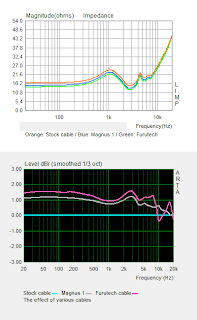 And the plots on the left shows Magnus 1 surely does what it is supposed to do, but my random $25 furutech cable from Ebay performs better than Magnus 1. How odd. 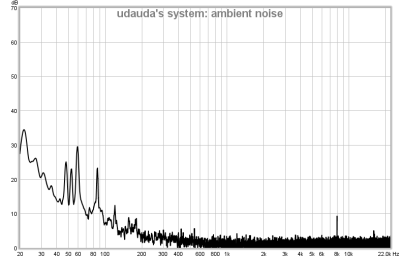 ON SECOND THOUGHT #4: Just found a 2cc coupler measured frequency response data of a custom 4.Ai. With the acoustic input impedance difference between a 2cc and an occluded ear simulator in mind, this plot corresponds quite well with my data, including the distinctive notch at 3 kHz ~ 4 kHz range. 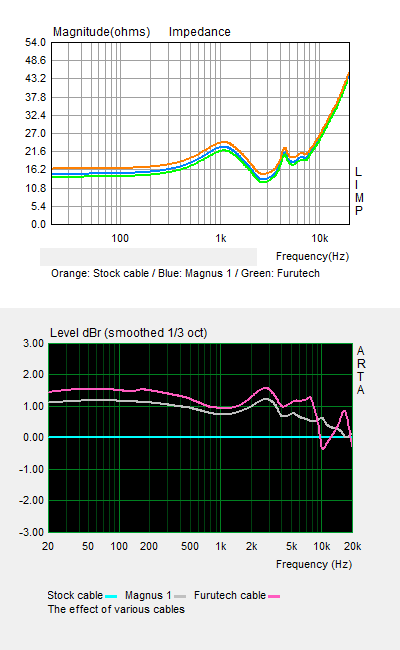 The cyan curve is an unaided real ear gain, referenced to free-field @ 0-degree. Magenta is the aided real ear response of 4.Ai. Red is my ear simulator gain, raw. There are a few things that need to be addressed. 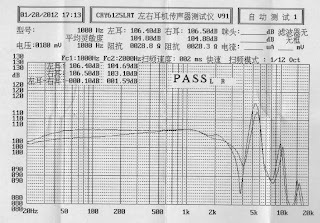 First, although deviating below(or above) 2 kHz, possibly due to leakage cause by the probe microphone or to the actual RECD characteristic of the individual, existence of the same 4 kHz notch is evident. 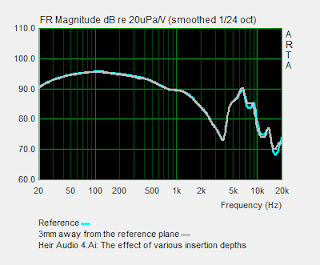 Second, free-field reference introduces linear distortion, according to Theile's study published in the late 80's. Third, 3 kHz peak is a natural ear canal resonance, which defines the mid-range fidelity, not something to be cut off. Their arguments definitely do not prove anything related to what 4.Ai was rated for, and contradict the basic principles of human HRTF. But then again, why would basics matter if the manufacturer do not care for them? The 10 kHz cliff strikes me as confusing. Is there something else going on, as I fail to see how its crossover setup would yield such a type of ultra-high frequency shelving. 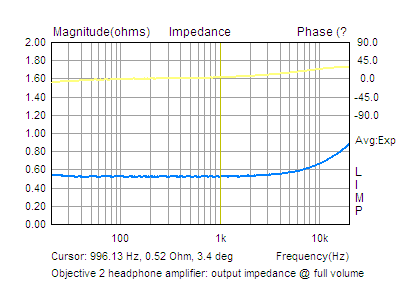 A normal TWFK-30017 with a high pass RC filter and a white 680 ohm acoustic filter simply does not behave that way. 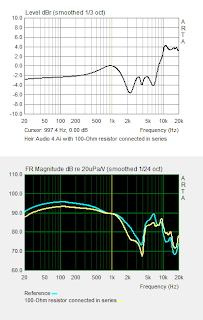 Unless intended by the manufacturer, there is a crossover network frequency mismatch between the woofer and the tweeter, just like the ones you can see on bookshelf loudspeakers of some mini stereo systems. On top of that, the notch on the right channel is actually deeper, which means this IEM has not been pair-matched. 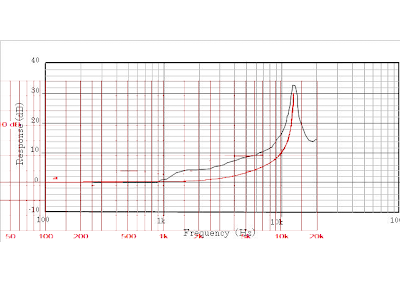 And that is how TWFK usually behaves in the upper frequency range, Nothing abnormal there. I didn't say anything about the 4k notch. I know it's there. I can hear it. Yes, and it's also apparent that there's channel mismatch. The point is, if I play a tone a 1k, and then a tone at 12k, with the ER4P and 4A volume-matched at 1k, the 4A will sound louder at 12k than an ER4P. Also, I thought the TWFK dropped linearly from 10k to 16k, not a fast drop from 10-12k, and then a small rise. Why's it normal behaviour? I've never seen it do that before, not in high end customs, nor in the B2/DBA-02/R-50/UE700. 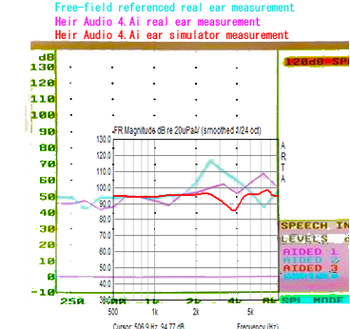 First, we need to understand how our hearing system functions according to the equal-loudness contour. Simply listening to a sample tone through an uncalibrated level does not yield anything valid. Second, that is a typical TWFK behavior, when it is measured slightly away from the reference plane, although the insertion depth issue is not big of a deal with a TWFK to begin with. Interestingly, the insertion depth I utilized in this analysis is all the way up to the reference plane. Thus, I suspect it is due to the physical phase offset correction done by the manufacturer, placing TWFK further away within the housing. I've always wondered why measurements are always equalized to 1k. What is the use for that, other than for convenience? The highest hair cell density isn't there. Perhaps musical instruments overlap the most there. International standards recommend the reference frequency to be @ 500 Hz, of which the acoustic input impedance of a human ear canal starts to kick in. I can do that too, but sometimes headphones, especially multi-driver ones, tend to have a lot of deviation in the lower frequency range. 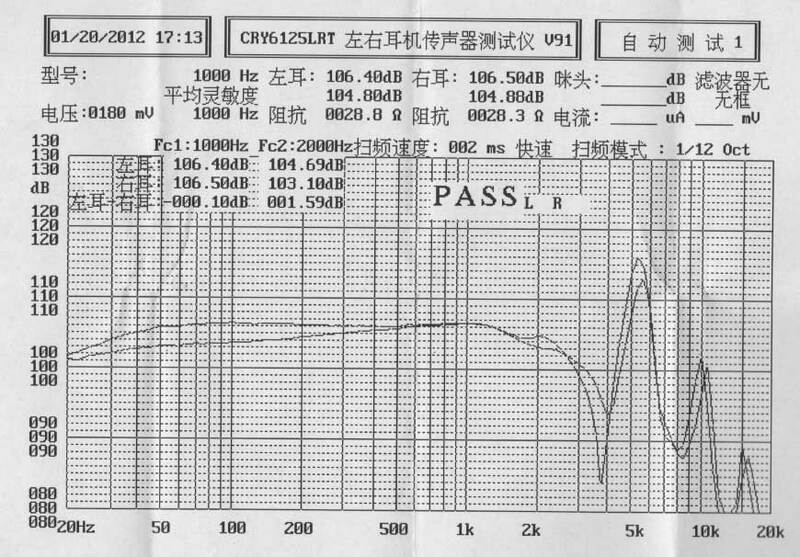 Thus, I can say such normalization @ 1 kHz is more for the readers' convenience. If this is a case of the resonant peaks getting pushed forward, would it make a 3k difference? It still doesn't make sense to me. Since the insertion depth deals mostly with the half-wavelength resonance of the simulator, whether pushed forward or backward, that notch will always be there. And you *were* included in the list, at Inks's request, but I did need confirmation from you directly, and no, I never received it (even after sending several reminders to Inks). I waited for three weeks after I'd received the last of the other participants' confirmations, then I had to give up and launch the tour without you. So Heir Audio has nothing to do with it: I was the one "choosing" the participants (I actually chose about half, the others being Head-Fiers Shotgunshane suggested because he had already been in other such tours with them and thus trusted them). And I state it again: I never received your emails; I even checked my spam folder, at the time. I have sent the opt-in request twice. Hmm..
What could've possibly caused the trouble? ... but why didn't you send me a PM on Head-Fi then? It's odd how that occurred, but it doesn't matter either way, I went over to Rin's place to fill in the gap. Even though you don't work for Heir Audio, they did choose you to organize This right? If so, good choice by them as you have been doing an excellent job organizing this. The email confusion is a thing of the past now, I think there are better things ahead. I do applaud Heir for letting these go out on tour. I hope it's a learning experience for them and take pointers, as there are certainly things to improve on. I do hope that was partly one of the reasons for the tour, to see where things can be improved based on 3rd party criticism. The aim of the tour, for Heir Audio, is simply to allow people to try their IEMs and provide feedback to other people. Thanks for this analysis! That deep-null is very interesting. I believe it is the reason why some say the sound is disjointed. However, there are many others who say it is quite linear and only slightly warm,possibly unaware of the dip. Heir actually released a new series, the dual-driver "Tzar". The 350 ohm version in particular is touted to be very "neutral", and is said to have a peak slightly lower than that on the ER4S. Wonder if that doesn't have the issues of the 4ai.